It’s a question that keeps coming up: Who is this person in my dryer? I don’t mean there’s actually a human being in my dryer, of course. That would be mean, and very cramped (although not impossible, if the college story my friend tells is true). I mean that every time I take clothing out of our dryer, I have a bit of an identity crisis. There are burp cloths tangled around maternity t-shirts, tiny diaper covers Velcroed to the thick seat of my bike shorts, and bras with much more infrastructure than previously necessary. I must look like a beginning stargazer, squinting sideways, mouth agape, as I try to identify each article: Mine? Graham’s? At least Jim’s clothes are all the same. But I keep wanting to ask: Who are we now? The process of getting our clothes clean does seem to represent motherhood perfectly, though. I can almost always start a load of laundry, but the follow-through is inevitably not so hot. I’ll shove everything in and forget to turn the machine on, or put all the wet clothes on the line to dry and forget they’re there when it starts to pour rain. Or I’ll wash and dry everything just fine, and leave it smashed in the hamper for four whole days. It’s always something. This is my new life. It doesn’t really bother me, all this underachieving in the laundry department. I’m getting used to not ever completing a single task all at once. I wash my hair in one showering, and condition it in the next. I water one half of the plants on the back porch, and hope I can return for the other half. I start a sentence and can’t quite . . . The thing is, I really like seeing baby clothes on the line outside. I like that I never finish an email in one go, because there’s always something I’m more compelled to do. That something is my son. It’s cheesy, but it’s true. I’m happy for the distraction. What does bother me is how the laundry concept translates to the kitchen – or doesn’t translate, as the case may be. You can’t start cooking chicken, get busy with a baby, and just serve the chicken raw. Dinner is not usually delicious half-cooked. Oh, that? Honey, that’s a cake. I made it just for you, only I never got around to putting the batter in the oven. Sorry the candles don’t quite stand up. Luckily, I have enough common sense – barely – to know that starting in on a batch of homemade ravioli is a really bad idea these days, if I actually want to serve it for dinner. Ditto for anything that requires attentive browning, or baking, or even a stir-fry that requires too much chopping. Or, for that matter, anything that has to be cooked by me, as opposed to my husband, who often swoops in mid-meal when Graham gets hungry or cranky. Simply put, I have abandoned the old kitchen Jess and developed a new persona there. The new kitchen Jess has been doing things in 5-minute chunks. I’ll marinate chicken for the grill at 9 a.m., or cook wheat berries at 10 p.m., just because I know that chances are good our kid will be asleep at 11 p.m., when I need to take them off the stove. I cook simply, relying mostly on olive oil, salt, pepper, and good basic ingredients. I rarely make more than one thing that requires more than 10 minutes of my time, and – here’s the kicker, the biggest change – I almost never add additional tasks while I’m cooking, because putting the knife down to coo at Graham is way more fun (no offense) than, say, scribbling down a recipe for this here blog between stirs. Herego, the scrumptious recipes I do want to share, like the orrecchiette I sautéed last week with Swiss chard, tomatoes, and summer squash and drizzled with a goat cheese cream, never get written down. (Okay, so that one wasn’t so simple. Delicious, though.) Like the laundry, it’s not that I mind the new program, but it does take some adjusting. The most basic problem with the new deal in the kitchen is that I don’t always get to eat what I want to eat. I’ve been eating cherries, but with the time required to pit the things, cherry pie is definitely out. The hubby has been requesting ribs, but I’m not sure I can hack the incessant basting required of my favorite recipe. My yearly batch of raspberry jam? Yeah, right. 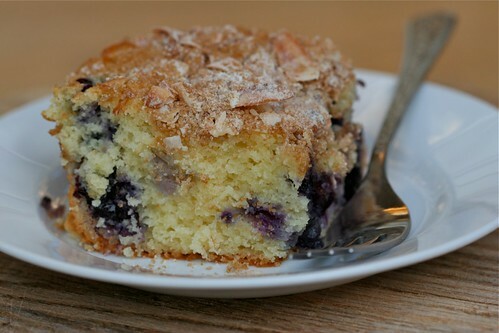 Last weekend, when the glossy leaves of the huckleberry bushes we encountered on a hike reminded me of the Trafton family birthday cake, I started hankering for a fat, fluffy cake with berries buried in the bottom. I didn’t have to have the exact birthday cake – my birthday’s a month away still, after all – but something similar was in order, something rich but still light, made with the blueberries rolling out of our local markets right now. I needed a ten-minute blueberry cake. I assumed it would be weeks before I could get to it. Then my Friday afternoon plans fell through. Exhausted by a 45-minute stint as Mr. Personality at my doctor’s office, Graham started rubbing his eyes – a first for him, talent-wise, and a sign I decided I shouldn’t ignore. I tucked him into his crib, and by the time his eyes were closed for good, I’d slid a cake into the oven. 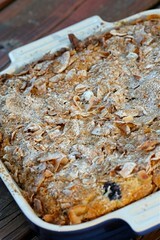 It took 15 minutes, to be honest, because at the last minute I snowed it with a coconut streusel, on a whim. Graham stayed asleep for another hour. While the cake baked, I wandered around the house, collecting the sheets I left on the line outside overnight, putting away dishes I’d meant to put away that morning, replenishing the dog’s water. . . Then I just sat at the kitchen table with a glass of water, breathing in the scent of a cake baked from start to finish without any major distractions. It’s a new kitchen, but it feels good to know that sometimes, I can make the same things. And some day, I know, baking a cake won’t seem like a big deal at all. Made with honey-flavored Greek yogurt (I used the “Greek Gods” brand from Seattle), this cake is a tangy, airy, crunchy-topped celebration of summer. I like it best at about 4 in the afternoon. Preheat the oven to 350 degrees. Spray an 8” square (or 9” round) cake pan with the vegetable oil spray and set aside. Melt the butter in a small saucepan and set aside to cool. Whisk 1 1/2 cups of the flour, baking powder, and salt together in a small mixing bowl and set aside. In another bowl, make the streusel: stir together the remaining 1/4 cup flour, the brown sugar, and the coconut, and set aside. In a big mixing bowl, whisk the sugar, yogurt, eggs, and vanilla together until blended. Add the melted butter in a slow, steady stream while whisking, then fold the dry ingredients in with a spatula until almost all the white is gone. Gently fold in the blueberries. 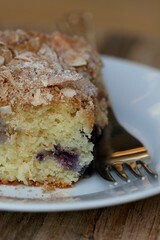 Scoop the batter into the prepared pan, smooth it flat with a small spatula, and top with the streusel. Bake the cake on the middle rack for 40 to 50 minutes, or until the cake is browned and firm in the center. Let cool 15 minutes in the pan before cutting into squares and serving. The fact that you are putting the cake and not the diaper covers in the oven shows that you have held onto your sanity through sleepless in Seattle and are over the newborn hump. And now you understand the attention span that some of us mere mortals have in the kitchen and this recipe is going to the top of my list. that cake looks so good, thanks for the recipe! Jess, I made your cake last night and it is delish. I took it to some one’s home for dinner and everyone loved it. I have one question. Why do you not put butter in the streusel mix? I felt like I almost had too much and it was too dry. I didn’t want it to be too coffee cakey… but I’m sure you could cut in a quarter stick of butter if you want something that adheres to the top a bit more. That cake looks divine. I’m looking forward to making it. It really won’t be long at all before Graham is in the kitchen stirring right along side you. As soon as Thomas (my 2.5 year old) could sit up unassisted I put together a “kitchen play box” of cooking items like spice jars full of dry rice and dry beans (tightly sealed), a wooden spoon, a small pot, a small bowl, a pie pan, some parchment paper, etc. We had so much fun with that box. Now he just raids the drawers himself; coming into the living room with a beater in hand suggesting we make cookies. A dear friend surprised me with 6 pints of fresh picked blueberries last weekend and I knew what I wanted to make with them ~ your delish looking cake. Unfortunately, I didn’t have much success. I made it in a 9inch pan but the middle never cooked fully ~ I made another thinking I just needed practice with this new recipe but again, the middle never cooked. I cooked at 350 degrees for 45 minutes and pulled it out becuase I was worried about the top burning. Does this ever happen to you? I will try it again becuase it is too yummie not to perfect. And it was not a total waste since my husband and I managed to polish off the whole thing without many complaints. EEeeek! Charlie, bad NEWS. I’ve made it twice without any trouble, but ovens vary… it sounds to me like yours needs a bit longer to cook. Perhaps make sure your rack is centered in the middle of the oven, then if the top starts to look a bit dark, cover it loosely with foil or place a heavy baking sheet on a rack immediately above it. Let me know!